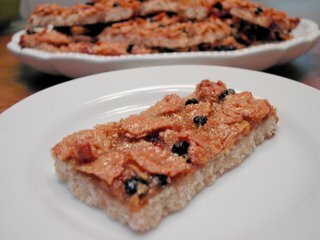 I made another version of the cereal bars I posted a while back. This time I used Post Blueberry Morning Cereal. All the other ingredients, (including Smart Balance Spread), remained the same as in the original recipe. Another difference is that I doubled the recipe because I wanted to use all of the cereal that I had left (about 3 cups). Since I used the same baking sheet as the last bars I made, where I did'nt double the recipe, these bars turned out a bit thicker. The thickness of the shortbread crust made a difference in texture and flavor. In this case, Smart Balance Spread did not do the recipe justice. The shortbread crust was a little on the dry side and lacked that true buttery flavor shortbread is known for. I think in shortbread recipes, where butter is a key ingredient, you probably should'nt substitute with margarine. Even though I love Smart Balance Spread, and use it in most recipes, this is one time it failed me. Don't get me wrong, the bars were still delicious, but they would have been even better with butter! Do you have a favorite butter substitute that works in all recipes? annie I am not sure there is a substitute for butter - never tried any. Unless you are allegic...why sub out the peanut butter? I use Smart Balance spread if I'm on a toast kick, or sometimes for putting on steamed veggies if I have it on hand. Otherwise I usually stick with the real stuff. Most 'light' baking recipes I try don't call for a butter substitute - they might use canola oil or yogurt, something like that. I think I might have used a light margarine when I made Sweet Potato Brownies. Hi Annie! I love cereal bars...but I love Rice Krispy treats the best! I'm a butter fan for baking and stuff, but use Earth Balance if it doesn't involve cooking. I am not really that concerned with substitutes. I use butter if I have it (rare) otherwise I use whatever margerine we have in the fridge. Product Review...the good, the bad and the ugly!